In targeting Roskam, they see a district where Democratic presidential nominee Hillary Clinton beat Republican Donald Trump by seven percentage points after her more liberal rival, Sen. Bernie Sanders (I-Vt.) won the Democratic primary. The 6th District is one of 23 so-called split districts nationwide where that happened. 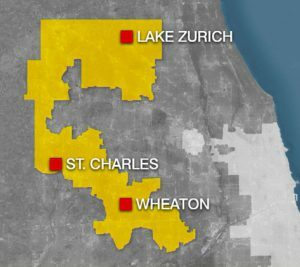 Located just northwest of Chicago, the district is a microcosm of Midwestern suburbia. It’s home to such upscale towns as Barrington, Naperville, Wheaton and Lake Zurich. Eighty-five percent of residents are white and nearly half are college-educated. With a median household income of $85,655, it has been reported as the highest-income district in Illinois. Both Roskam and Casten are longtime residents. Roskam, 57, grew up in the district and first won election in 2006, when he defeated current U.S. Sen. Tammy Duckworth (D). He previously served in the Illinois state senate and house. The former lawyer is currently chairman for the House Ways and Means Committee’s subcommittee on tax policy. He is also co-chair of the Republican Israel Caucus and the U.S.-Korea Working Group. In the 2016 election, Roskam won his district by 64,964 votes —18 percent — over Democrat Amanda Howland. Before the July 26 debate with Casten he had not debated an opponent since 2008. The candidates differ fundamentally on taxes, such as the Republican-led 2017 tax law that offered its most significant cuts to wealthy Americans and corporations. Roskam, a co-author of the bill, says that the act provides $4,600 in income tax relief to families in the district making $135,000 a year. Casten is concerned about adding an estimated $1 trillion to the federal budget deficit and the “historically high levels” of wealth inequality that these cuts could intensify. On health care, a critical issue nationwide in the midterm elections, Casten wants to expand the number of people who receive taxpayer-funded health care. Roskam has called the Affordable Care Act “a failure” and voted repeatedly to repeal it. Both candidates say they will tackle the opioid crisis. In May 2018 Roskam introduced a series of bipartisan bills intended to make physicians’ prescribing practices stricter. Casten supports expanding health care to cover treatment for opioid addiction. Casten, whose company Recycled Energy Development’s mission is to profitably reduce greenhouse gasses through recovering otherwise wasted energy, said his top priority if elected will be finding solutions to climate change. He called climate change “the existential challenge of our lifetime.” Casten’s proposed initiatives include modernizing the Clean Air Act to make standards more strict and introducing a fossil energy reduction standard that would mandate higher levels of renewable energy on a national scale. Casten supports nationwide carbon regulation, including putting a price on carbon emissions. Roskam is opposed to such a tax and thinks the private sector should address the issue. Both candidates oppose Donald Trump’s withdrawal from the 2015 Paris Agreement. In an election where many Republicans are being judged on their support or opposition to President Trump, Roskam has voted with Donald Trump 95 percent of the time, according to FiveThirtyEight. The candidates squared off regarding Donald Trump in their final televised debate on Oct. 22.